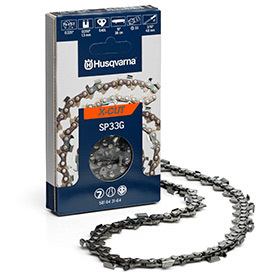 The X-Cut SP33G is Husqvarna’s first-ever chain designed, developed and manufactured in the company’s state-of-the-art production facility in Sweden – from materials to final product. Available for a limited selection of its 400 and 500 series saws, this is the first model of the new line of X-Cut chains the company will roll out in the U.S. over the next years. The chain is a low-vibration pixel chain made of chrome and steel with optimized material hardness and structure. The carefully engineered thickness of the chrome layer ensures a lasting sharpness and high capacity. This chain requires less power from the saw than the standard cutting systems and delivers an optimal cut due to its unique cutting angle design, making for a long-lasting chain while increased sharpness lets users finish in less time. Thanks to the small arrow-shaped channels in the links, the X-Cut SP33G achieves superior lubrication results by transporting oil to the chain during operation. It comes pre-stretched from the factory, preparing it for use right out of the box, saving time and decreasing the risk of damaging the cutting system with a slacking chain.